According to Buddhist tradition, Prince Siddhartha Gautama (Sakyamuni Buddha), the son of King Suddohana and Queen Maya, was born on 8 April 566 B.C. in the garden of Lumbini, in Nepal. 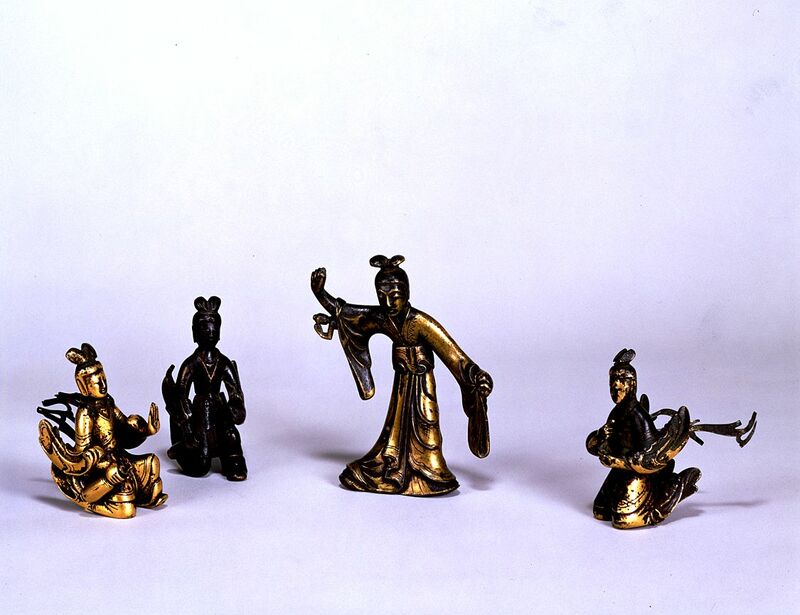 In Japan, the event of Buddha’s birth is celebrated on April 8th (or May 8th in others…the 4th month in the Chinese lunar calendar is translated into April or May.) to the Buddhist calendar as the Flower Festival or Hana Matsuri(花祭り). On this day, all temples hold Kanbutsu-e (Japanese: 灌仏会), 降誕会 (Goutan-e), 仏生会 (Busshou-e), 浴仏会 (Yokubutsu-e), 龍華会 (Ryuge-e), 花会式 (Hana-eshiki) or 花祭(Hana-matsuri, meaning ‘Flower Festival’). The first event was held at Asuka-dera in 606. 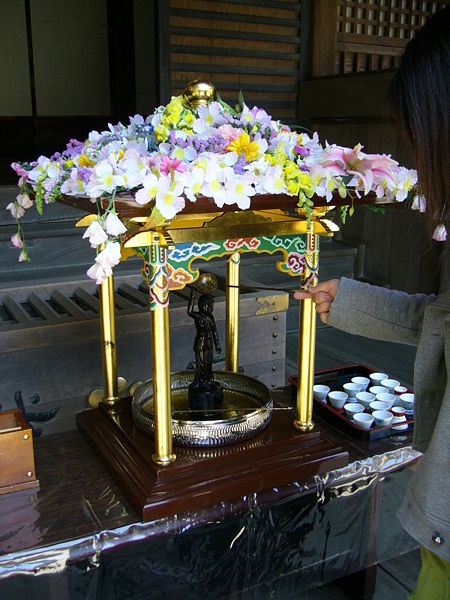 Temple visitors bring spring flowers as offerings to decorate a statue of the Buddha and symbolically pour sweet tea sweet tea, called ama-cha, made from hydrangea leafs over the statues, recreating the legend that at birth, Buddha was sprinkled with perfume by two Dragon Kings, ryuu. Another alternative version of the legend is that a gentle perfumed nectar rain fell from the sky bathing the baby Buddha. “Twenty-five centuries ago, King Suddhodana ruled a land near the Himalaya Mountains. One day during a midsummer festival, his wife Queen Maya retired to her quarters to rest, and she fell asleep and dreamed a vivid dream. Four angels carried her high into white mountain peaks and clothed her in flowers. A magnificent white bull elephant bearing a white lotus in its trunk approached Maya and walked around her three times. Then the elephant struck her on the right side with its trunk and vanished into her. 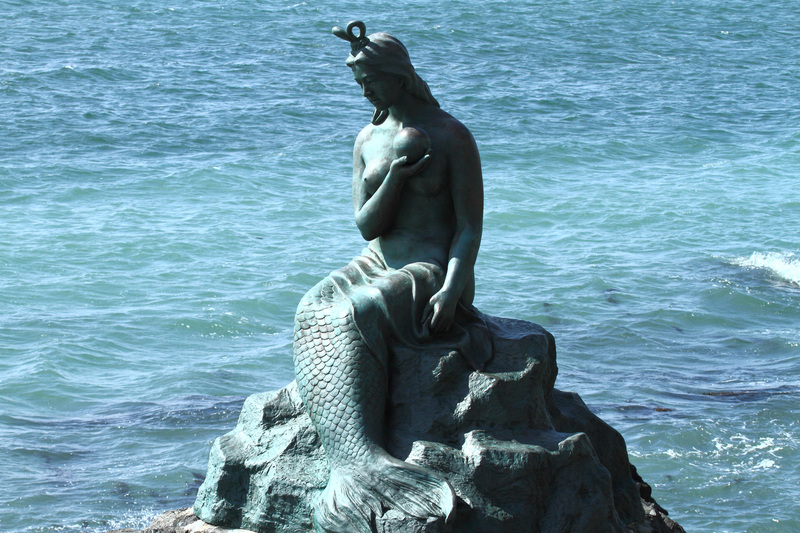 When Maya awoke, she told her husband about the dream. The King summoned 64 Brahmans to come and interpret it. Queen Maya would give birth to a son, the Brahmans said, and if the son did not leave the household he would become a world conqueror. However, if he were to leave the household he would become a Buddha. 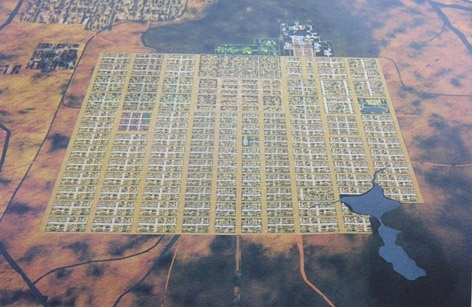 When the time for the birth grew near, Queen Maya wished to travel from Kapilavatthu, the King’s capital, to her childhood home, Devadaha, to give birth. With the King’s blessings she left Kapilavatthu on a palanquin carried by a thousand courtiers. On the way to Devadaha, the procession passed Lumbini Grove, which was full of blossoming trees. Entranced, the Queen asked her courtiers to stop, and she left the palanquin and entered the grove. 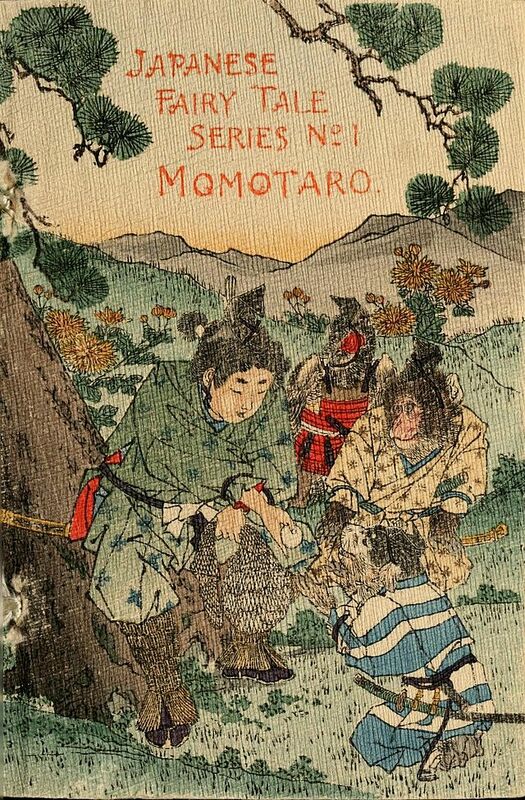 As she reached up to touch the blossoms, her son was born. The ceremony of bathing the Buddha, called Kanbutsu-e (潅仏会 – The Bathing of Buddha), originated from China, but is first known to have been performed Asuka-dera in the year 606, in Nara. 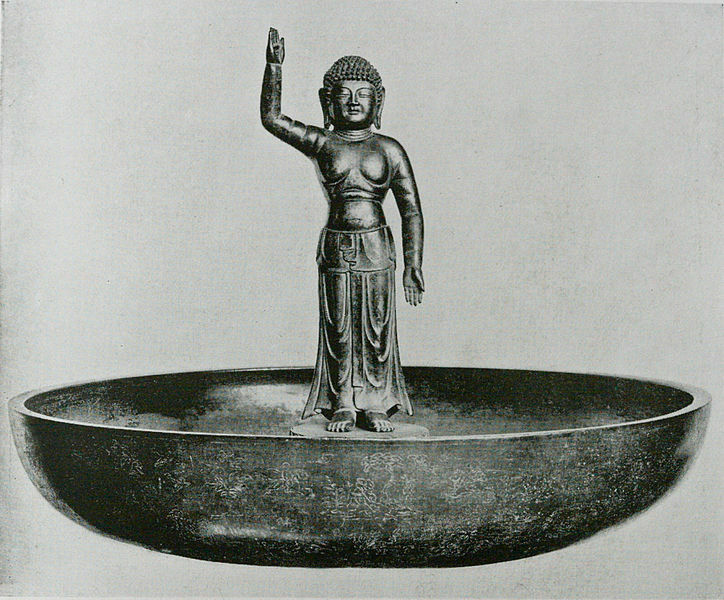 On a flower decorated altar (hanamido), symbolizing the Lumbini garden, a small statue of Buddha, Tanjoubutsu (Buddha’s Birth), is placed in a shallow metal bowl. The statue represents the infant Buddha, who according to oral tradition, immediately after birth, stood up, seven steps forward while pointing his right hand to the heavens and left hand to earth, said: “I alone am honored in heaven and on earth” (Tenjou tenga yuiga dokuson – 天上天下唯我独尊). In the Kamiyoshida district of Chichibu, Saitama, children sprinkle flower petals along a mountain trail as part of the Tsukagoshi no Hana Matsuri (flower festival of Tsukagoshi) on May 4, an event mainly organized by schoolchildren. Before the festival, the children decorate the hanamido float and upper grader boys will stay overnight at the Kumano jinja to guard the float and Buddha statue. After hearing the sound of fireworks at 7 am, the children gather at Kumano Jinja shrine in the center of town and start walking. Carrying a hanamido float and a Buddha statue they march up the Yoneyama Yakushido temple on a mountain side about 300 m away. 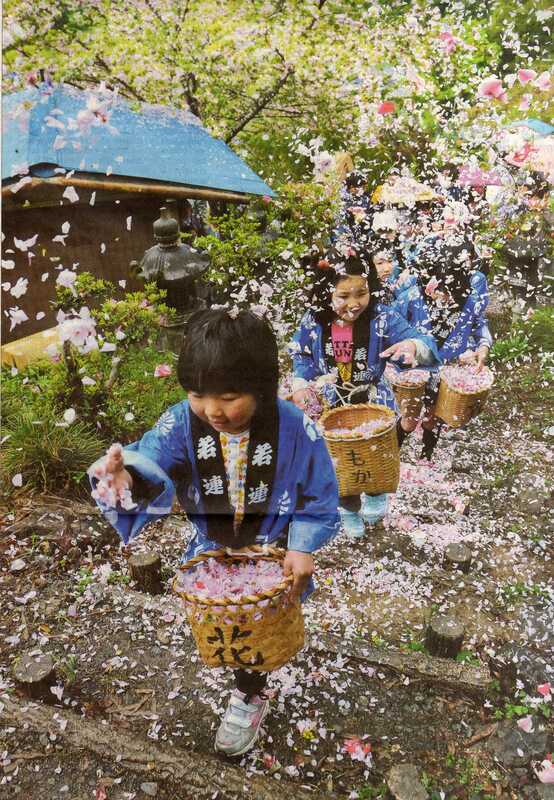 During the procession, the children scatter the petals of cherry and peach blossoms, camellia and dame’s violet to brighten the mountain path. 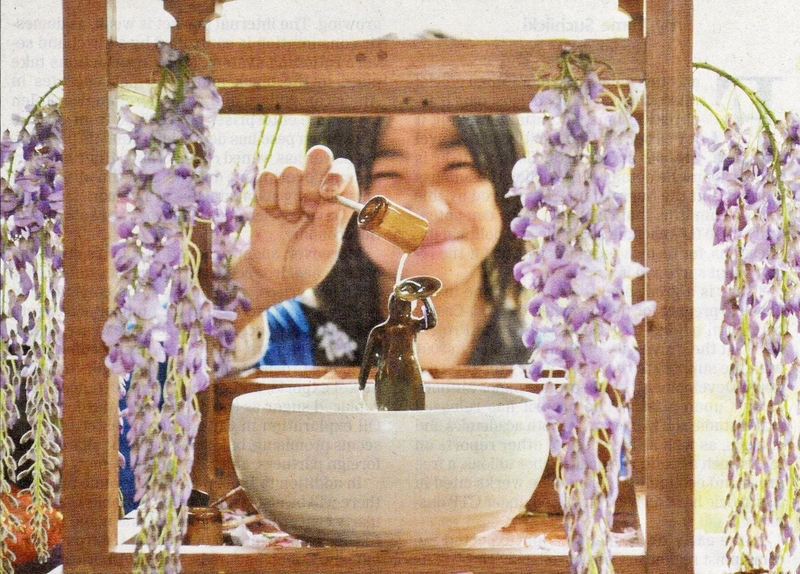 After arriving at the temple, the children enshrine the statue in the hanamido and place it outside the temple, pouring sweet tea over it and joining their hands in prayer. Matsuo Basho, wrote a haiku, inspired from a baby deer born on Buddha’s Day. According to another oral tradition however, Gautama Siddhartha, the future Buddha, appeared to his mother before he was born in a vision in the form of a white elephant. 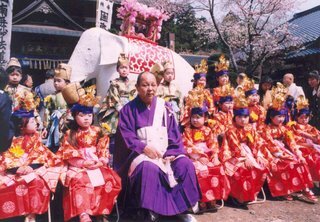 A white elephant float is an integral part of the day’s(Apr 5th) procession at Nippon-ji Temple in Tako Town, Chiba Prefecture, Japan. The temple is ancient and very famous temple of the Nichiren School of Mahayana Buddhism. Flowery feast for Buddha’s birthday (Scenes from the Archipelago), The Daily Yomiuri May 19, 2012 …article on how the Kids’ flower festival in Saitama is celebrated.